Mystic Journey Bookstore Event, “The Little Dog That Could” Book Signing and Presentations, with Bestselling Author and Show Host, Filippo Voltaggio; and featuring World Renowned Animal Communicator and Author, Diana DelMonte. The Little Dog That Could is the fantastically true story of a man and the little dog, Ciccina, that came into his life as his mentor—to help him understand the world beyond his human senses and to experience life, love and healing beyond his human understanding. And the adventure is not yet over. After Filippo interviewed World Renowned Animal Communicator Diana DelMonte on The LIFE CHANGES show, Diana learned of Ciccina, and telepathically communicated with Filippo’s little dog. In her sharing of her communication, she shares information that even Filippo did not know, adding more to the lessons and the exciting intrigue. We can add to the list of mentors, Ku Ku, a wacky wisdom teacher, and protagonist in Diana’s book Ku Ku Zen: A Private Look Into The Heart of Zen, Living With Cats, and Without Them – a story about attachment and loss, and Diana’s brief encounter with the young feline who takes her down a bumpy road to awakening. 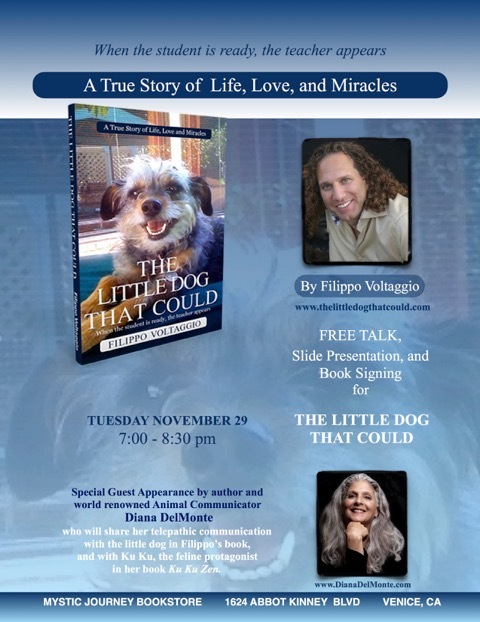 In this unique presentation, Filippo and Diana will present their experiences of life, love and miracles lived and learned from their animal companions and respective mentors, a little dog and a little cat that could, and did! Perfect for animal lovers and non-animal lovers alike, in time for Holiday giving, both Filippo and Diana’s books will be available for purchase and for personalizing and autographing by each of them respectively. During his formative years, Filippo was sharing everything he learned about self-improvement with his friends and family and has since become a leader in the Industry having parlayed that desire, ability and knowledge into a life pursuit, passion and career. His interviews, books, speaking engagements and workshops take a unique approach by focusing on the lighter side of improving one’s life, self-esteem, as well as the connection with one’s purpose, making the process at once, fun, funny and transformational, profound and powerful. After many years of certifications, in the various esoteric fields, he now holds most dear his life coaching and hosting of the show, “The LIFE CHANGES Show,” which is host to a cornucopia of guests from famed celebrities and respected scientists and doctors to everyday people who are changing their lives, the lives of others, and/or the world in a positive way. Filippo and his show are the recent winners of Barack Obama’s President’s Call to Service Award. As a Life Coach he has created two workshops, “The RECALIBRATION,” and “The Life IMPROVment Workshop,” which are foundationally based to help individuals, groups, corporations and organizations make positive and lasting change from the ground up. Diana “Dexter” DelMonte is a world renowned animal communicator and author of two books. Diana is also a Kundalini yoga teacher, healing practitioner,and spiritual activist; vegan for the animals. As a visual artist and educator, Diana has taught yoga, art, and meditation, as well as animal communication, to thousands of children in Los Angeles. Diana believes that animal communication is the groundwork that makes communication with all life possible. Her recent book, Why You Should Listen When Your Animals Don’t, presents animals as mirrors – and demonstrates how our animal’s behavior and health mirror who we are. Our companion animals, she says, give us the opportunity to learn about ourselves,and to grow spiritually, if we are willing to listen. You can read Diana’s monthly column, Animal Insights, in Whole Person magazine. Presently Diana lives in Los Angeles with her four feline roommates. She regularly holds animal communication workshops in Los Angeles.